Southern Utah University’s own Dr. Virginia Stitt was added to the Utah Music Educators Association’s (UMEA) Hall of Fame at their Mid-Winter Conference this February. 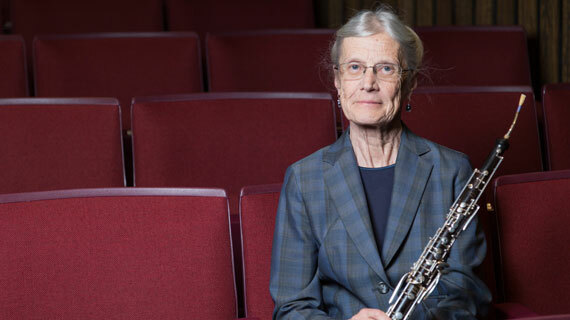 For over 40 years, Dr. Stitt has shared her love and knowledge of music with countless students from SUU in general education classes as well as with the many music majors who have come from the department. Dr. Lawrence Johnson, Chair of the Department of Music at SUU, shares, "Dr. Virginia Stitt is extremely deserving of this induction into the UMEA Hall of Fame. She has been, and continues to be, a mighty pillar in the music educators’ world, both locally and statewide. Her genuine commitment and dedication to the success of each and every student is truly unmatched. In particular, the SUU Department of Music is indebted to her vast wisdom and historical knowledge of all things music education...we couldn't be prouder of the privilege to call her an esteemed colleague and friend." Dr. Stitt has taught over 300 music graduates who continue to work as music educators and performing musicians after graduation and many more who support music and the arts in their communities in countless ways. Dr. Stitt enjoys the excitement of seeing students grow in their passion for, and knowledge of, music. The College of Performing and Visual Arts at SUU congratulates Dr. Virginia Stitt in her well-deserved induction into the UMEA Hall of Fame. The College of Performing and Visual Arts (CPVA) at Southern Utah University comprises 26 academic programs including liberal arts (BA/BS) and professional (BFA, BM) degrees in art, design, dance, music and theatre. It includes graduate programs in the fields of arts administration (MFA, MA), music education (MME), and music technology (MM). More than 60 full-time faculty and staff are engaged in teaching and mentoring nearly 700 majors in the College. CPVA presents over 100 performances, lectures, presentations, and exhibitions each year and is affiliated with the Southern Utah Museum of Art (SUMA), Utah Shakespeare Festival, and the Center for Shakespeare Studies. Southern Utah University is an accredited member of the National Association of Schools of Art & Design (NASAD), National Association of Schools of Dance (NASD), and the National Association of Schools of Music (NASM). Visit the College of Performing and Visual Arts website for more information.